Whispers in the Loggia: Blaze at Holy Name... But No "Great Fire"
Blaze at Holy Name... 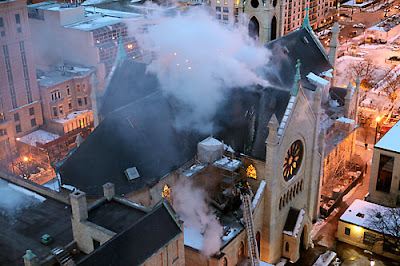 But No "Great Fire"
Built after its predecessor was destroyed in the city's Great Fire of 1871, a three-alarm blaze struck Chicago's Holy Name Cathedral early this morning, taking some two and a half hours before it was declared under control. 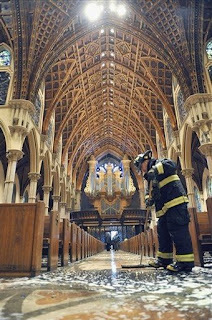 That said, the fire's toll on the 1875 Gothic structure -- mother-church of the nation's third-largest diocese -- was mostly water damage; the cathedral's roof was punctured, icicles formed on light fixtures and its basement endured extensive flooding, but reports from inside Holy Name once the cleanup began said that its marble and wood-paneled sanctuary and ceiling were substantially intact, and that even the galeri of the Windy City's five deceased cardinals (below) remained in place above the apse, albeit "soaked." 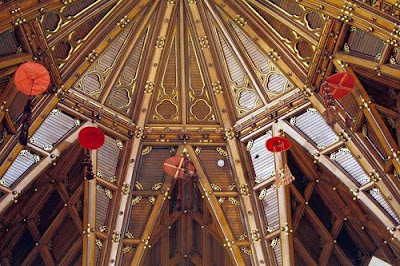 It was only in November that the seat of the archbishops of Chicago reopened following a nine-month closure for emergency structural repairs after a chunk of woodwork fell from the ceiling last February. Showing up on site as the fire wound down, Cardinal Francis George evoked history, telling reporters that "Chicago has always bounced back from fires and we'll bounce back from this. "I'm just grateful to God that the damage isn't worse than what it was," the eighth archbishop added. Its last major renovation completed in the late 1960s, the fire came in the midst of a $10 million campaign to fund the cathedral's maintenance and repair efforts.